The Great Pyramid of Giza is one of the seven wonders of the ancient world and the only one that has withstood the test of time. For centuries people have studied this enigmatic structure, trying to understand its true significance; ancient Egyptian pyramids are generally still considered tombs for deceased pharaohs. After extensive research Willem Witteveen connects data from his own findings with that of other researchers, resulting in groundbreaking conclusions about the true function of the Great Pyramid and its place in history. The Greek mathematician Pythagoras stated: “All is number.” The American prophet Edgar Cayce claimed: “Sound is the medicine of the future,” and the late Egyptian wisdomkeeper Abd ‘el Hakim Awyan always said: “It is all about sound.” Willem Witteveen proves that all these men were right and that what we now regard as groundbreaking and new often originated in ancient Egypt, well before the first Egyptian dynasties. This book is divided into five main parts, four of which relate to the four earthly elements Earth, Water, Air and Fire. The fifth part relates to the element or quintessence called Aether. Each of these elements represents a significant process inside the Great Pyramid but they are also directly related to creation itself. The four earthly elements together form the circle of creation, which is crowned by the fifth divine element Aether. Within this circle all processes on Earth and beyond take place, and the element Aether represents the divine world and is the carrier of all information. The author demonstrates that the Great Pyramid is an enormous library of knowledge, intended for modern generations and containing the golden frequency of Giza, one of the basic values responsible for creation and the existence of life on Earth. We ourselves are the architects and builders of these magnificent ancient monuments. We ourselves in the future tense! People who have read this book will never look at the Great Pyramid of Giza in the same way again. It will drastically change your view on human history and, by changing the perception of time, perhaps even change your life. One suspects that he is on the right track when he discusses such topics as sound and resonance, antennas, the Schumann frequency, and the special abilities of quartz, hydrogen and wavelengths. Special Web Price Discount! A deluxe and fascinating book! 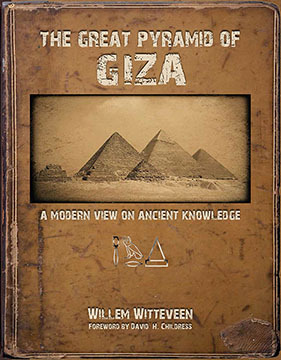 THE GREAT PYRAMID OF GIZA: A Modern View on Ancient Knowledge By Willem Witteveen, Foreword by David Hatcher Childress. 384 Pages. 8.5 x 11 Hardback. Illustrated. All Color. Bibliography. Index.